I am not a Tofu fan, in fact I am far from being one. I was kind of repulsed by it in the beginning but now I have warmed up enough to be sharing a recipe on my blog! When I first tasted tofu in India years back, I thought I am never going to eat this again and that’s actually very rare with me. I am the most non-picky eater you will ever find, I can eat anything and everything as long as it’s vegetarian. So me not liking something is a big surprise! But me being me, I had to give tofu another try after I moved to US and it was then that I realized that tofu is not bad. Definitely I don’t love it still but I can eat it once in a while easily. The only tofu that I like is the extra-firm variety and that’s the only one I eat. 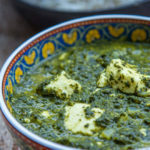 Palak Paneer or spinach with Indian cottage cheese (paneer) is a very popular Indian recipe, one that you find on the menu card of every Indian restaurant and this Palak Tofu recipe is exactly the same, the only difference is that I have swapped the paneer with tofu. I have made this vegan by adding coconut milk but regular milk would work just fine. 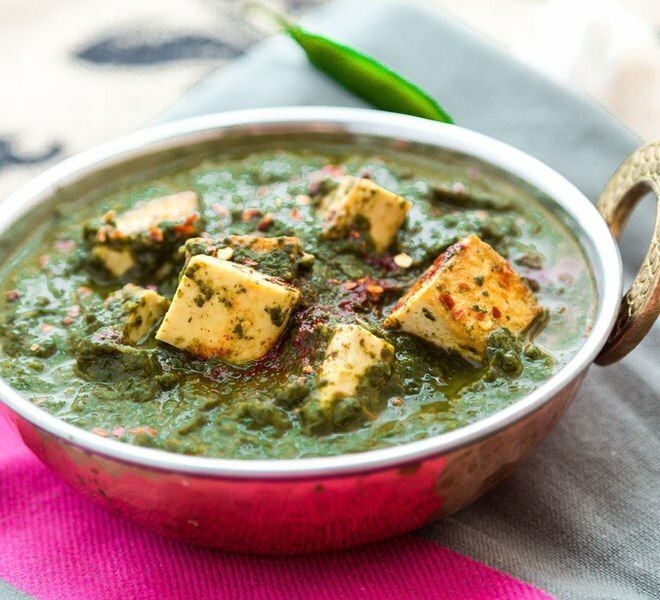 Traditionally though when palak paneer is made, people add cream to it but my version with tofu is healthier and hence there’s no cream, only milk. You can definitely add cream to bring in that richness and creaminess to your curry. To make this curry, spinach leaves are first cooked with tomatoes, garlic, ginger and spices and then grind to a fine paste. Tofu is roasted for few minutes on a pan and then added to the spinach curry. This is your healthy, wholesome dinner and you cannot go wrong with this. I had mine with brown rice and it made for a very filling meal. You can eat it with any Indian bread or with rice, quinoa etc. Wash spinach leaves thoroughly. Heat 1 teaspoon of oil in a non-stick pan on medium heat and add spinach leaves to it in parts. Cook the spinach till it’s wilted, around 1 minute. Repeat the same process till all spinach leaves are done. Set aside. In another pan, heat 1.5 teaspoon of oil on medium heat. Once hot, add roughly chopped ginger & garlic to it and saute till raw smell goes away. Add cubed tomatoes next and mix. Cook till tomatoes are soft and mushy, around 3-4 minutes. Add the spinach leaves and also add cumin powder, red chilli powder, salt and garam masala. Cook the spinach and tomato with the spices for 2 minutes. Remove from heat, let it cool down a bit and then transfer mixture to a blender. Add 1/4 cup of coconut milk or milk and grind to a smooth paste. Set aside. In a pan heat 2 teaspoons of oil. Once the oil is hot, add cubed tofu and sprinkle paprika, salt, pepper and red chilli flakes. Saute for 5-6 minutes till tofu is light golden brown in color. Set aside. Take the same pan in which you had cooked the tomato and spinach and add the spinach puree to it on medium heat. Add additional 1/4 cup of coconut milk or milk and mix. 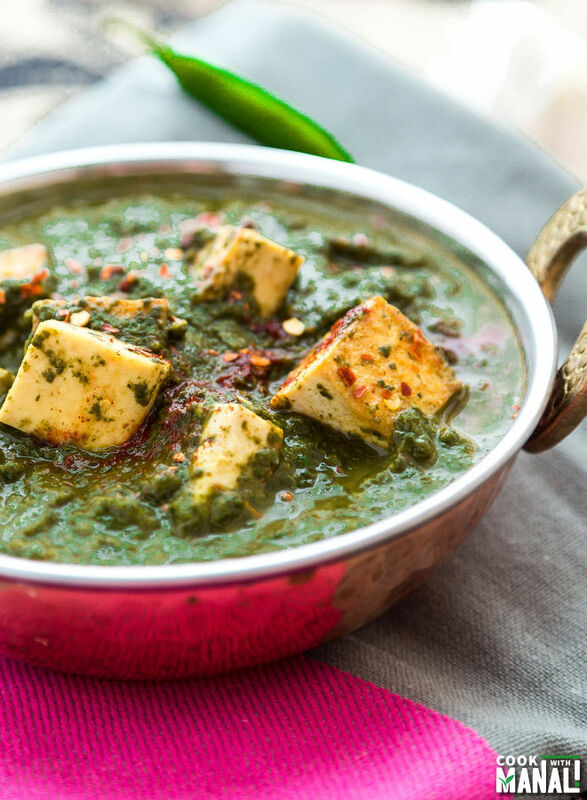 Add the sauteed tofu to the spinach curry. Mix well and also add water at this step [if required] to adjust the consistency of curry to preference. Add sugar/honey [if using] and mix. Cover and let the curry simmer for 10 minutes on medium-low heat. 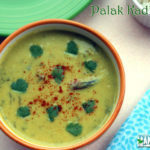 Serve hot with Indian bread or rice! Squeeze in some fresh lemon juice (optional) before serving. * Use coconut milk in place of milk for a vegan recipe. * Use heavy cream in place of milk for a creamier curry. Pan-fried tofu cooked in a spicy spinach curry. Heat 1 teaspoon of oil and cook the baby spinach till it's completely wilted. Set aside. Add cubed tomatoes next and cook till tomatoes are soft and mushy, around 3-4 minutes. Add the wilted spinach leaves and also add cumin powder, red chilli powder, salt and garam masala. Remove from heat, let it cool down a bit and then transfer mixture to a blender. Add 1/4 cup of milk/coconut milk and grind to a smooth paste. Set aside. Take the same pan in which you had cooked the tomato and spinach and add the spinach puree to it on medium heat. Add additional 1/4 cup milk/coconut milk and mix. Mix well and also add water at this step [if required] to adjust the consistency of curry to preference. Add sugar/honey [if using] and mix. Squeeze in some fresh lemon juice (optional) and serve hot with Indian bread or rice! 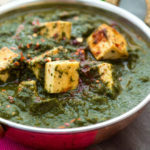 Palak paneer is my absolute favorite indian vegetarian dish! This sounds so delicious. I must try it some time with the tofu? tofu! * not sure why that came out as a question mark! 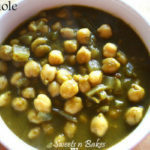 Thanks Karishma, if you like tofu then you will definitely enjoy this recipe! I’ve only had tofu a handful of times. You are definitely making me want to try it again! This dish sounds delicious! I love the spinach curry, too. Thanks Gayle, tofu is not bad but it’s not my favorite either! I eat it once in a while, doubt I can eat it every day/week! Thanks Emma! yeah this is a good way to eat tofu for someone like me who isn’t fond of it otherwise! 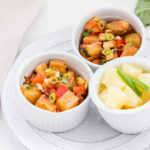 I usually cook tofu most nights so this recipe is perfect for me. Going to be trying it with both tofu and tempeh. Thanks for the recipe and idea. I am so glad you posted this recipe. So So SOOOO Glad! 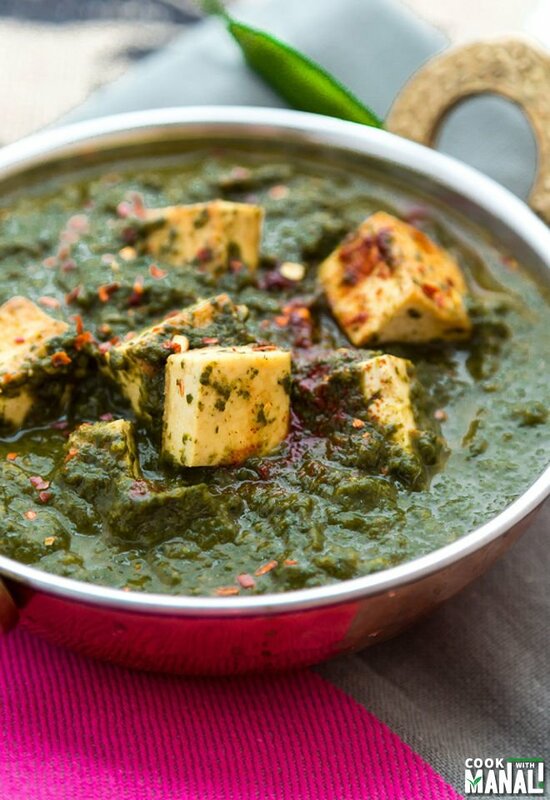 Before my vegan days I used to always order palak paneer at Indian restaurants. Lately I’ve been having some major cravings for it so I will need to try this out. I’m soooo excited for this recipe right now 😀 Just wrote down all the ingredients so I can make it tomorrow. I’ll let you know how it goes! I made this today. It’s so amazingly flavorful! My only substitution is that I used a bag of frozen spinach. It’s great that the ingredients are things I have on hand, yet they combine into a flavor that makes my taste buds tingle. Thanks! Oh I love this recipe!!! I love curry and spinach and I’m a big fan of tofu. But only when it’s prepared properly. I’ll give it a try very soon. Wow! Lovely, tasty, healthy recipe! Tried at home, evry1 lyked it. Superb recipe.?? Made this tonight! It was a huge hit with the hubs and our toddler!! Fabulous recipe. Will definitely make it again. I actually used kale in place of the spinach and it worked well. Thankyou. Welcome Rhea, glad you liked! This was delicious! Thank you for sharing the recipe. Cheap, fast and incredibly delicious – can’t wait to try more recipes from your blog! Thank you so much! Glad you liked Emily! Happy new year! Omg omg omg this is the most delicious thing I’ve ever had the pleasure of making! My hubby helped by tending the tofu fry while I made the sauce, so it was a joint effort. I didn’t want to save the other half pound of tofu so I put it in the air fryer with some oil spray and seasoning. (Short cut! )and added it to the sauce, with the expertly seasoned and fried portion my hubby made. This was seriously so amazing, I can’t wait to have a dinner party and serve it to my friends! For the sauce I used a box of frozen chopped spinach plus a 5 oz bag of fresh. The seasoning!!! To die for! Seriously a great recipe. Omg that’s the sweetest comment ever! Thank you Lix, you made me happy today! Glad you guys enjoyed it so much! My young son declared himself vegetarian a few months ago (6 y/o) and he has stuck to his guns, so I have been scrambling to find good ways to make tofu! Palak is my fav. indian curry, so maybe this will really win him over! Will be trying it soon! Looks wonderful! Hi. How many people is this recipe intended to serve? I am cooking for myself. Thanks! why aren’t you pressing the tofu? In my opinion, pressing is essential. Once I found out about it, I changed my mind about tofu. It removes excess water, allowing the tofu to soak up more flavors when it’s cooking and makes the texture far less mushy. I hope you’ll consider trying it by sandwiching a pound-slab of tofu between two cutting boards and weighing it down with something heavy, like a few 16oz cans, for about twenty minutes (though as little as five minutes will work) before preparing it. There are also are inexpensive tofu presses available. Wonderful! As good as or better than any restaurant. I doubled the spices per my taste. Will make again and again. I love you blog! Hi! I’m cooking for children hence I was wondering how spicy the curry sauce turned out?